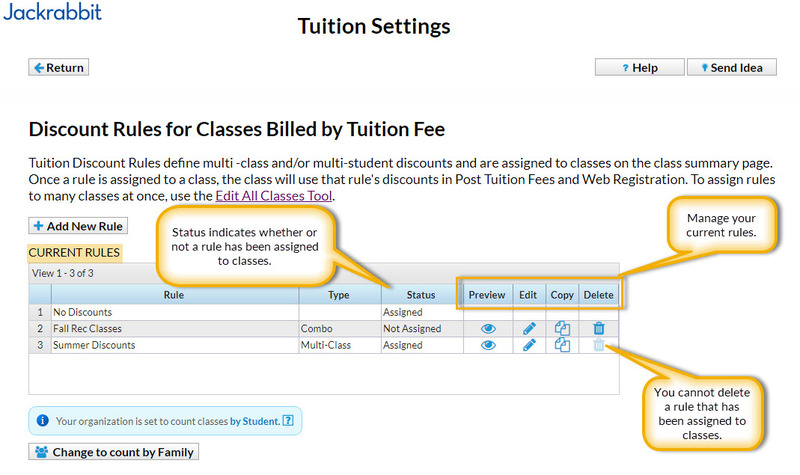 You can manage your Tuition Discount Rules from the Tools menu > Edit Settings > Tuition Settings. Click the Manage Rules button to open the Discount Rules for Classes Billed by Tuition Fee window. From this screen you are able to preview, edit, copy, or delete your current rules. Click the Eye icon to see an example of how your tuition fee will be discounted according to the rule. The Enter a Tuition Fee field defaults to $100 but you can change that amount to the actual amount of your class tuition for the illustration. You can look at the effect on your tuition fee when both types of discounts (Multi-Class & Multi-Student) are given in a Combo type discount rule or you can look at each discount type separately using the Both, Multi-Class, and Multi-Student tabs. Use the Pencil icon to edit a current rule. 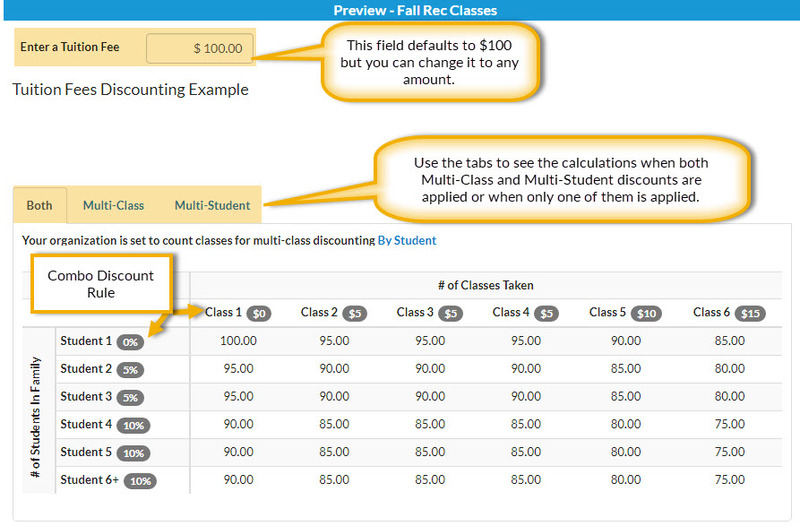 On the Edit Discount Rule page you can rename the rule and/or change components of the Multi-Class or Multi-Student discounts. You have the option to preview the rule before saving your edits. Quickly create a new Discount Rule by copying the settings from a current Discount Rule with the Copy (pages) icon. Give the new rule a name, make any necessary changes to the discount settings, and Save Changes. Click the Trash Can icon to delete a Discount Rule. You cannot delete a Discount Rule that has been assigned to classes in your database. Before you can delete a rule with the status of Assigned you will need to edit the classes that have that Discount Rule assigned and change them to a different rule. The quickest way to do this is using Edit All Classes from the Classes menu. Use the search criteria to bring up only classes with the Tuition Discount Rule you want to delete. In the report results you can use the Global Change area (highlighted yellow) to change the Discount Rule for all of the classes at once.